People strolling along Vancouver's Waterfront Trail may have noticed a curious sight earlier this summer. Three people in a small skiff pulled up to a piling topped by a large nest. Tying up to the piling, the men raised a ladder out of the boat. The squawks of an adult osprey, circling protectively above the nest, carried across the water. The trio were on a mission with the U.S. Geological Survey: to collect blood samples from young ospreys in the lower Columbia, Willamette and Boise rivers. Worldwide, scientists use ospreys as "canaries in the coal mine" for pollution entering rivers. 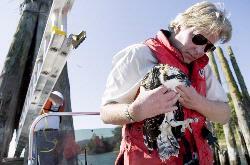 "Osprey are fish-eating hawks at the top of the aquatic food chain," USGS researcher Jim Kaiser explained. "Thus, they are useful in monitoring the health of the waterways." That's why Kaiser and other USGS researchers have been taking egg samples, drawing blood and monitoring reproductive success of ospreys on the Willamette and lower Columbia since the early 1990s. The raptors aren't shy about setting up nests in the most heavily populated, industrialized stretches of river. "One hundred percent of their diet is coming from the river," said USGS scientist Charles Henny, who has been studying ospreys since his doctoral dissertation in 1969. He added that the raptors make excellent subjects because they tolerate short-term disturbance by scientists. Henny, based in Corvallis, Ore., has tracked the steady recovery of the osprey since the 1970s, when the federal government banned the use of DDT. The chemical pesticide, once it flowed into rivers and made its way up the food chain, thinned the eggshells of ospreys and other raptors and hampered their ability to reproduce. Researchers studying osprey on the Columbia have documented a steady decline of legacy pollutants such as DDT and polychlorinated biphenyls in eggs over the past couple of decades, Henny said. Yet, newly emerging pollutants continue to pop up. This summer, researchers aboard the small boat cruised the Columbia, Willamette and Boise rivers looking for evidence of a chemical flame retardant used to fireproof furniture foam, televisions and other consumer products. While the chemical effectively suppresses the fire risk, it is also showing up in birds, fish and even human breast milk. These chemicals share a nasty characteristic with PCBs: They don't break down quickly in the environment, and they "biomagnify" as one creature eats another right up the food chain. At the end of that food chain, according to the Environmental Protection Agency, these chemical flame retardants may cause human health effects related to the liver, thyroid and neurodevelopment. Henny said it's unclear how the chemical might be affecting ospreys, but researchers found polybrominated diphenyl ethers (PBDEs) in osprey eggs during their last survey along the Columbia in 2004. (They didn't evaluate PBDEs during the survey in 1997-98). Researchers this year collected a sample egg and took blood samples from 40 nests on the Columbia, the Willamette as far upriver as Eugene and on the Boise River in Idaho. The blood samples will provide a basic health screen, highlighting any serious afflictions. With the egg and blood samples in hand, researchers will track the reproductive success of the nests. Columbian staff photographer Steven Lane contributed to this story.